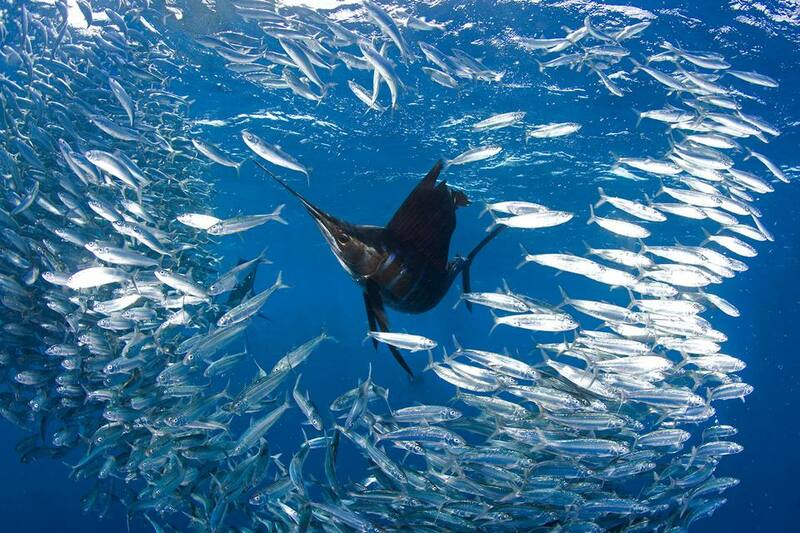 A sailfish feeding on sardines. The oceans are a giant bowl of soup where everything eats something and itself is eaten by something. Microscopic bacteria, tiny plankton, algae, marine grasses, fish, and giant whales all end up as food at some point in time. And don't forget the critters that crawl, slither, or walk on the bottom of the ocean. Every species in the ocean has its preferred food, but most (not all) will settle for something else when faced with starvation. The differences between an herbivore's and a carnivore's digestive system are quite remarkable. A herbivore's digestive tract is quite a bit longer than a carnivore's because it takes more time for a herbivore to break down vegetable matter fiber that contains cellulose. The herbivore's digestive tract contains a huge amount (billions) of symbiotic bacteria, which break down the cellulose fiber. This fiber contains no protein, but an herbivore gets protein by digesting the symbiotic bacteria themselves. The herbivore's system can digest starches, which the fish needs for energy. A carnivore's digestive tract is much shorter than an herbivore's. It produces digestive enzymes and acids which break down meat so it can be absorbed and utilized. Marine herbivores consume plant life such as macroalgae, microalgae, and true flowering marine plants such as the seagrasses. Many herbivores, such as the surgeonfish, primarily dine on algae but are not averse to eating something with a meat base when given the opportunity. Good examples of this are the yellow tang and naso tang which will consume certain red algae and green algae by the bucketful but will gobble up mysid shrimp when given the chance. On the other hand, most fish which are carnivores, such as the dragon moray eel, volitans lionfish, or striped mandarinfish will not touch algae even if they are starving to death. Algae and seagrasses: These are true herbivores. Algaes: Macroalgae may be eaten by omnivorous fish incidentally. Algae and detritus: Eats accumulated organic matter as well as algae. Sponges: Angelfish feed primarily on sponges, which may be eaten incidentally by other fish. Plankton feeders: Often, plankton are supplemented by algae and leafy greens. Generalized bottom feeders: Usually are opportunistic and feed on whatever is available. Fish feeders: Carnivores prey on other fish. Coral feeders: These eat the soft polyps found inside the hard skeletons of stony corals. Crustacean feeders: These eat crabs, shrimp, worms, and clams. Generalized invertebrate feeders: These eat a wider variety of invertebrates. Parasite pickers: These fish pick parasites off of other fish as part of their diet. Ideally, the fish and other critters in your saltwater aquarium should be fed their preferred food. That is the food the species is used to eating in nature and it provides all of their nutritional needs to survive and thrive. In a saltwater aquarium, many fish (even carnivores) can be weaned off of their usual fare in the wild and coaxed into taking hand fed foods such as pellets and flakes with their protein requirements being supplemented with frozen foods such as mysid shrimp, fish, squid, or krill. How Often Should I Feed My Saltwater Aquarium Fish?